Truth is not just stranger than fiction; it's also much stronger than fiction. Whether it's used to solidify your thesis, build an airtight case to put a criminal behind bars, or--in the hands of debut filmmaker Neill Blomkamp-- to make a movie, when it comes to building blocks, you should always start with truth. And with District 9, Blomkamp augments a work of science fiction that unnervingly at times teeters on the brink of reality. In the Peter Jackson production (Lord of the Rings), Blomkamp avoids the standard practice for alien fare and post-apocalyptic paradigms. In place of traditional genre trappings, the gritty South African slum set film feels like a near docudrama. Boldly District 9 takes a revisionist approach to history with its matter-of-fact set-up that life is the same as usual... aside from the fact that more than twenty years ago, aliens landed on our planet. The predictable next step would be a War of the Worlds battle. However, Blomkamp goes for the unexpected by establishing that foreign governments have decided that the aliens posed no international security threat, despite the fact that the rather unpleasant and snarling creatures aren’t exactly the Jim Henson style Muppets aliens we typically see onscreen. No, the main problem seems to be the sheer number of unwelcome intergalactic “immigrants” that are also depending on our dwindling resources. Since it’s best to keep the problem “out of sight, out of mind,” security regarding the aliens is outsourced to a corporate, private version of the UN with the film's fictitious organization of Multi-National United (MNU). Controversial and filled with prejudice, the MNU polices the population of millions in a way they feel is more manageable with aliens corralled into the District 9 slum that has since grown rampant with crime, prostitution and violence. As he brings us up to speed in the complicated opening, Blomkamp mixes a healthy amount of fact in with the fiction by composing his ambitious tale that metaphorically addresses a wide range of dilemmas from immigration to international relations through cinematically mixed sources. By employing several tiny cameras rigged in the real-life sets, Blomkamp offers us a 360 degree view of the events all the while utilizing classic fiction filmmaking techniques before CGI is even introduced. 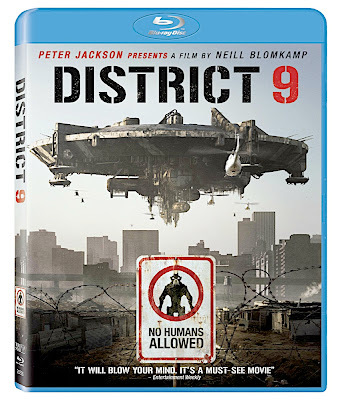 However, District 9 is set further apart from the science fiction pack by the decision to splice archived footage from 24 hour news channels around the world together with the rest to create a thought-provoking hybrid of entertainment and political allegory. Still, to remedy the problem of feeling like an entirely impersonal cable news segment, we're soon brought deep inside the MNU via Blomkamp's documentary approach, in which we're introduced to our recently promoted main character Wikus van der Merwe (Sharlto Copley). Having been given the prestigious assignment from his father-in-law, Wikus proves to be an unorthodox hero. And after he comes into contact with a strange liquid horded by aliens and finds his DNA changing rapidly, events take an adventurous but tragic turn. Now stuck between the two rival communities of humans verses aliens as his old employers are intent on turning him into a lab rat, Wikus escapes. When MNU retaliates by feeding Wikus to the news networks and he becomes a modern day version of The Fugitive, he has no choice but to head right into District 9 to seek refuge alongside those he used to raid. Reminiscent at times of the equally tough-to-watch science fiction thrillers including Children of Men, Minority Report, Cloverfield, 28 Days Later and I Am Legend, Blomkamp's intelligent work makes the most of its genre in using the paradigm to raise important questions about problems facing us today. Yet it's in Blomkamp's refusal to set the film in the extreme future along with the impressive amount of issues he's able to work into its 112 minute running that makes it easy to understand why both Blomkamp and his film have received both awards consideration and end-of-year distinction. Additionally, I was particularly blown away by Sharlto Copley's naturalistic performance that called to mind both Cast Away and I Am Legend as the movie at times is the very essence of a one-man show and Copley's Wikus is this District's beating heart. Although, despite this, it's not exactly the type of film I'd find myself reaching to watch again in the near future as Blomkamp's aim for in-your-face gritty urban hyper-realism cost the movie dearly in terms of empathy for its revolting characters. While obviously, I Am Legend and Children of Men aren't exactly movies you'd line up to see anytime soon either, the difference is that we still had empathy for more of the characters involved. Essentially Blomkamp's movie figuratively shoots itself in the foot... or rather in the first two acts with gruesome attention to detail that showcases the penchant for repulsion of its state-of-the-art effects departments over building a solid viewer connection with anyone other than Wikus. By holding us at a vomit bag length, it becomes both structurally awkward and even tougher for Blomkamp to try to undo the damage towards the last act of the film. Unfortunately, District 9 ventures away from its early tone by embracing the tried-and-true science fiction cliche of a father and son alien whom Wikus ends up forming an unlikely alliance, which we’ve seen before a bit too often in the genre. And despite the fact that the macabre visuals were far too intense for a majority of viewers, had Blomkamp kept up this style throughout, District 9 would've been a far more successful endeavor as a dystopian docudrama science fiction film. Instead, the attempt to go the Spielberg route-- even incorporating Blomkamp’s "don't look now" visuals-- to bring in a darker sense of E.T. near the end almost completely derails the District, if not for its excellent and truly empathetic final sequence involving Wikus and his now-estranged wife. BD-Live enabled with cinechat, District 9 also contains Sony's brand new movieIQ feature that offers viewers a plethora of related information regarding production secrets, music data, cast and crew updates and more while watching the film along with its constantly updating options for trailer streams, downloads, and more. However, the Blu-ray is a very special treat for those who own PlayStation3. Not only does it boast a digital copy to transfer a standard version of the movie to your PlayStation, Mac or PC along with a BD-enabled Interactive Map feature to explore "Joburg from Above," but it also offers a demo of God of War III. Successful completion of the third God of War Play Station game unlocks the "making of" the highly popular franchise game, which releases as a full-length title in March. The two disc Blu-ray set is also filled with Blomkamp's feature commentary, deleted scenes, and the three part documentary entitled "Alien Agenda" along with four separate featurettes that give you a fascinating glimpse at the worlds of visual effects whether achieved digitally or with costuming and makeup. Once again to optimize the experience of a film that was painstakingly conceived and executed by so many top-notch departments working in tandem, Sony continues to offer its picture calibration Easter Egg on Blu-rays wherein if you type 7669 (SONY), a brief series of test screens ensures that you experience District 9 in precisely the right manner it's meant to be seen. FTC Disclosure: Per standard professional practice, I received a review copy of this film to evaluate on Film Intuition for my readers, which had no bearing whatsoever on whether or not it received a favorable or unfavorable critique.